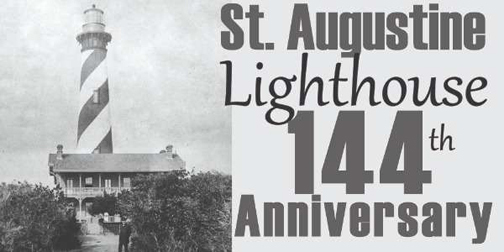 SAINT AUGUSTINE – An anniversary celebration marking 144 years is planned Saturday, Oct. 13, from 11 a.m.. to 3 p.m. at the St. Augustine Lighthouse,. featuring Meet-the-Lighthouse-Keeper photos, a cake cutting at 2 p.m., games on the front lawn, and self-guided tours of the historic tower and Museum exhibits. The celebration will launch a year-long observation culminating with the 145th anniversary on Oct. 15, 2019. Museum Members are always free! Oct. 20, meet archaeologists at the St. Augustine Lighthouse & Maritime Museum to discover history and mystery of local shipwrecks and honor International Archaeology Day. Archaeologists around the world use this annual event to demonstrate the importance of archaeology and its ability to uncover the past! Oct. 20 the conservation lab will be open to visitors to see first-hand artifacts from centuries ago. Shipwreck artifacts and stories of our maritime history bring the past to the present as we explore history exhibiting the relics of our ancestors. Regular admission fees to the Museum apply. From 10 a.m. to 2 p.m.., Lighthouse archaeologists will have a display of artifacts in the Maritime Archaeology and Education Center located on the museum site. Immediately following the presentation, join us in unveiling a state marker for the historic lighthouses of St. Augustine near the Lighthouse Boat Ramp. A special project of the St. Augustine Archaeological Association, this marker commemorates the various beacons that have stood sentinel over our coast and protected St. Augustine. The ceremony will begin promptly at 3 p.m.